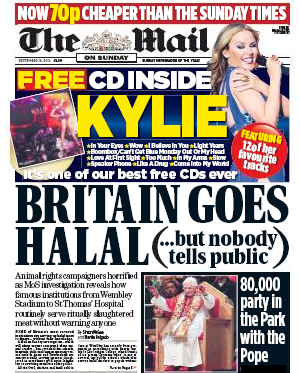 It looks as if the Mail on Sunday will be running another anti-Muslim story tomorrow to follow on from the typically nasty scaremongering story (pictured above) they ran on their front page last week about the increasing availability of halal meat in the UK. Noting that institutions such as Wembley Stadium, various hospitals and restaurant groups were now selling halal meat the Mail on Sunday last week criticised them for not telling their consumers that the meat was halal. Given the MoS’s long history of bigoted reporting of minority communities, one can’t help but think that its outrage was less about the failure to label the meat as halal and more to do with trying to stoke up public anger about the alleged ‘Islamification’ (a favourite BNP term) of Britain. Of course, the more plausible reason that large outlets are now purchasing halal is for business purposes. It makes better financial sense for the larger outlets to make fewer but larger orders from suppliers than to make multiple but smaller purchase orders. Given that situation, larger retailers are choosing to purchase halal to save on the costs that would be incurred if they purchased from multiple meat sources. Somehow I doubt that my quote – if it appears in tomorrow’s paper – will be printed in full, particularly that bit about ‘risible tabloid scare antics’. But, maybe I am being too cynical. We’ll find out shortly. I know it is not a very scientific way of establishing anything, but near where I live, we have a thriving Muslim-owned takeway that attracts plenty of non-Muslim customers. They seem to have no problem with eating halal meat. I am fairly sure it is the same right across the country. So, I think the main reason that the major supermarkets have thus far resisted labelling food as halal – except in areas with large Muslim communities – is that they are concerned with how right-wing tabloids would try and exploit that to incite mischief. Judging from the provocative antics of the MoS, their concerns would not be entirely without foundation. Update: As I predicted, the MoS did not use my quote in full but truncated it to remove my criticism of tabloids! This entry was posted in Islam, islamophobia and tagged halal meat, labelling, mail on sunday. Bookmark the permalink. Although I understand entirely your frustration with the tabloids about sensationalizing the issues. I think your statement is mis-understanding the perspective of other faith communities. It is not just about “taste”, of course all meat basically tastes the same. However, since this article appeared yesterday, I started to investigate this issue in two ways. Firstly I spoke to Jesus about it to see what he thinks, and secondly I consulted a person who has “the gift of discernment of spirits”, which is also described in the Injil scripture. People with this gift are able to see angels and demons and to identify them, and remove them if necessary; they are also able to see and detect land and things that have been defiled and are unholy, through bloodshed etc. I won’t go into details unless you are interested, however the result of my inquiries is a simple conclusion. The act of “blessing” meat on the occasion of its slaughter, has a definite spiritual effect, over and above the taste. According to the Injil, and my inquiries this is a negative effect as it defiles the meat. This is because the one true God, is a God of love and life, He celebrates and blesses life and love not death. So it turns out that “followers of Jesus Christ” like myself are expressly forbidden from eating Halal meat. Therefore the fact the meat is not adequately marked is a practical problem for us. After all my household likes KFC! So please could you help us by encouraging supermarkets to be genuinely accurate in their labeling. Please, I don’t want to be a vegitarian!